Fire Prevention Week is October 8-14, 2017. This year’s theme is “Every Second Counts: Plan 2 Ways Out! The UI&U major in Emergency Services Management prepares students to effectively handle a variety of dangerous situations, with a focus on emergency and disaster management, homeland security, and critical incident management. Career pathways include firefighter, paramedic, police officer, border patrol agent, emergency management director, fish and game warden, FBI agent & Homeland security director, and federal air marshal. 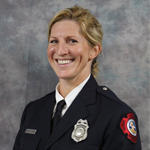 In recognition of our students in the Emergency Services Management degree program, the spotlight is on Mindy Simpson. 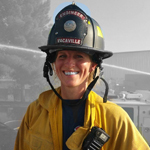 Mindy is an engineer with the Vacaville Fire Department and has 20 years of experience in the field. Get to know Mindy in the Q&A below. A. Completing my degree is a lifetime goal. I also wanted to set a good example that I could finish and be a college graduate. A. A co-worker told me about Union’s program. I am a mom, wife, student, and professional. I had to find an academic program that would work with me and my schedule. A. Union’s degree program is flexible and online. The professors provide a class syllabus with assignments and due dates. That was invaluable. I always know week to week what is expected of me. A. Get your degree before you have a family. A. The person who influenced me the most was my Grandpa David. He was a fire captain. He was respected by all. He had a gentle spirit and treated everyone with respect. He taught me to read people and have compassion. Join the exciting career choices in Emergency Services Management by clicking the button below, or call us today at 800-861-6400.